1. We buy more than our cupboards can fit. If you are cramming items on top of one another, you have too much stuff. You MUST learn to live with less. You cannot afford to cram your cupboards with items when you do not have space. 2. We buy too many appliances. Every home I work in has too many appliances. We all go through fad diets and end up buying a juicer, a bread maker, a NutriBullet, a Vitamix, a steamer, a one-pot hot pot… the list goes on. STOP BUYING SO MANY APPLIANCES IF THEY HAVE TO STAY SAT ON YOUR WORK SURFACE COLLECTING DUST. What do you really need? A toaster, a kettle/coffee machine. A NutriBullet/blender/Magimix etc. Everything else is not essential, or if it is, then you need to create a cupboard for it. It cannot sit on the side. If it has to stay on the side because there is no other space, you need to clear out somewhere else and make space. Unless you have a large kitchen and lots of space, do not keep all these appliances out. They take up so much space and generally look unsightly. Keep the bare minimum out that you use every day. If you use it once a week or less, put it away. Your kitchen sides will instantly look clearer. 3. Books need to be on shelves. FULL STOP. Not kitchen work surfaces or inside cupboards. They are using valuable space. Create space for them by buying a floating shelf or something else. Are you wasting space with bulky items like toilet roll? (shown below). There must be somewhere else these items can go? Think about what is taking up space and where it can be moved to. Remember all this advice is because you have little worktop/cupboard space. If you have space in excess then it is slightly different. But only slightly. All kitchens should be free of clutter and only have the everyday essentials out on the surfaces. By simply organising all your like products together this will make your cupboards look neater. Don’t mix them. Don’t have anything but tea/coffee and mugs in one cupboard. Glassware – all in one cupboard. Plates/ spices/Tupperware. Where possible everything should be together, not mixed. 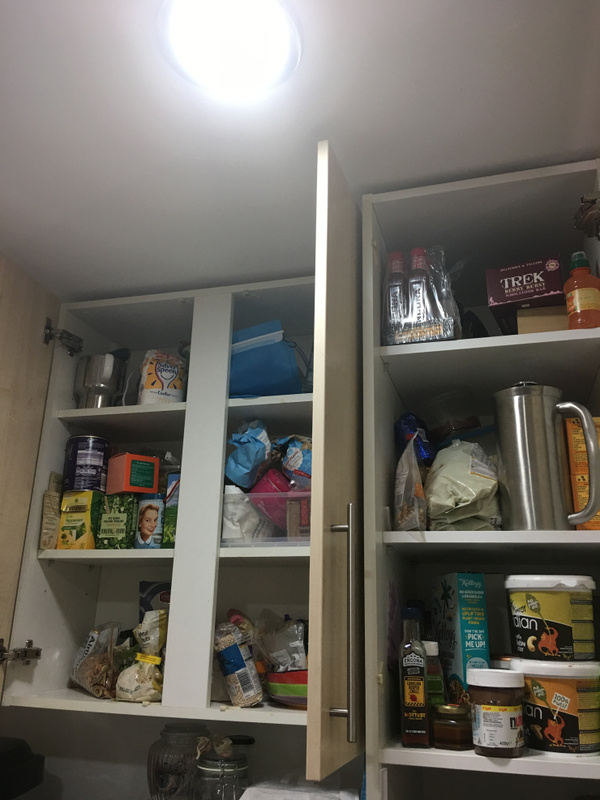 By simply emptying your cupboards into the middle of your kitchen and starting again you will see how much you have accumulated and be shocked. You will also then see lovely empty cupboards that you do NOT want to cram full of stuff. See below for my before and after pics of this cupboard. This is possible. You just need to re-jig the way you use your space. Small kitchens should be clean, clear and easy to navigate. Need help doing this quicker than you can?